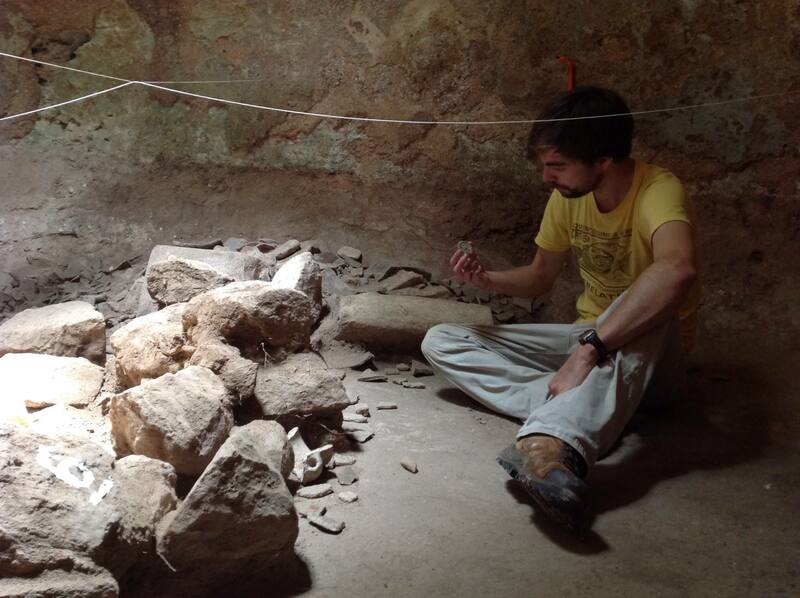 Photo 1: Archaeologist Evan Parker examining the chultun deposit. Photo by George Bey. Photo 2: Archaeologist Mandi Strickland excavating the chultun at Stairway to Heaven. Photo by George Bey. 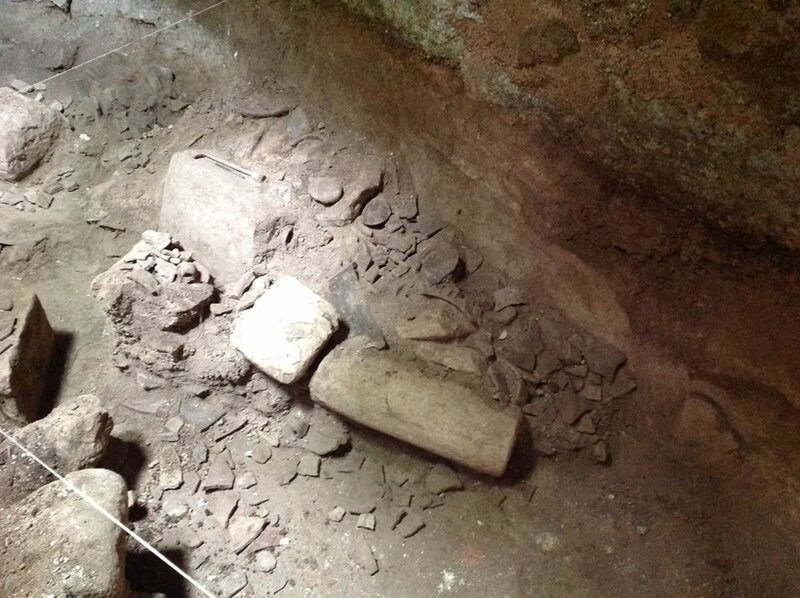 Photo 3: Artifacts covering a possible Maya altar inside the chultun. Photo by George Bey. Photo 4: Artifacts were removed in zones to keep associated objects together for analysis. Photo by George Bey. 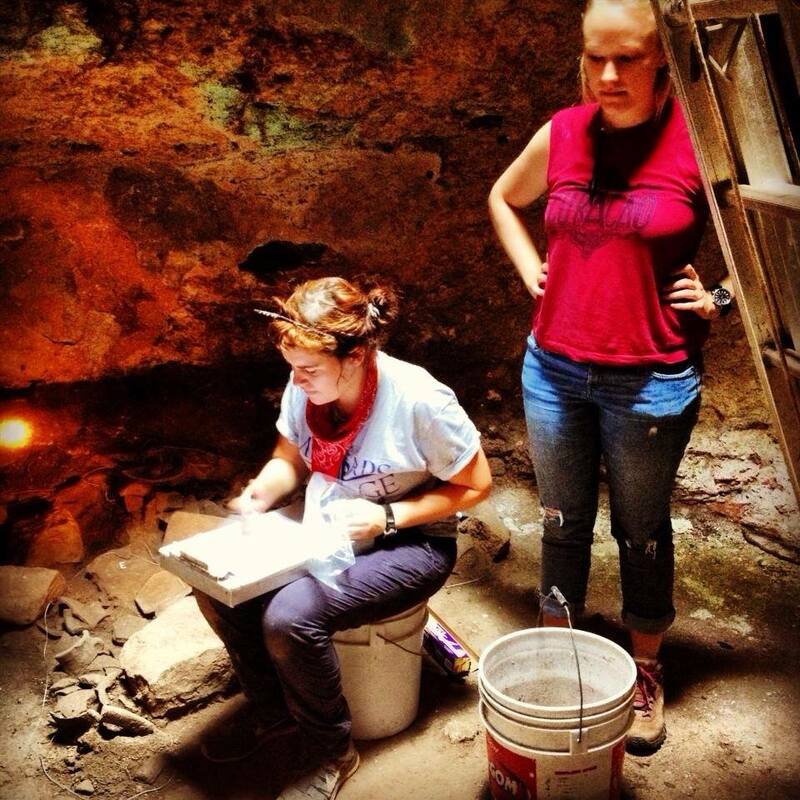 Photo 5: BRAP lab director Betsy Kohut discussing chultun deposit with assistant Lauren Voelker. Photo by George Bey. Photo 6: Chultun artifacts laid out in preparation for attempts to "refit" the pieces. Photo by George Bey. Photo 7: Refitted chultuneras, or water collection jars from the chultun deposit. Photo by George Bey. Photo 8: Rare Teabo red vase from chultun deposit. Photo by George Bey. Photo 9: Incense burner from atop the altar in the chultun. Notice the intense burning of the vessel. Photo by George Bey. This is the second post in a series by George Bey. Find his previous post here. Imagine you are trying to complete a puzzle that is made up of thousands of pieces of every conceivable size and shape. The puzzle is composed of an unknown number of three-dimensional objects that you have to put together simultaneously. Now imagine that you don’t even know if you have all of the pieces necessary to complete the puzzle. This is essentially what we have been doing for the past six weeks as we attempt to determine the nature of the ceramic deposit inside the chultun at Stairway to Heaven. As we excavated the interior of the chultun in the summer of 2014, removing the layers of soil that had accumulated since the abandonment of the hilltop community, archeologists Evan Parker and Mandi Strickland (photos 1 and 2) uncovered two very large deposits of pottery fragments, one on the north side of the chultun and the other on the south side (see the video in my previous post). They were the remains of an unknown quantity of Maya ceramic vessels, called Cehpech ceramics, which are traditionally dated to between A.D. 700-1000. We could see a variety of forms and sizes of these vessels as we exposed the sherds, and some looked complete, but we could not be sure what the deposit actually consisted of and how it was formed. The vast majority of the pottery was laying directly on the surface of the stucco floor of the chultun, mostly in two large clusters, suggesting that they were deposited at or near the time of the site’s abandonment (photo 3). The evidence indicates the deposit was created on the floor of the chultun while it was dry, possibly an important clue in the meaning of this deposit. Unless the chultun was no longer functioning as a water storage device, which we think was unlikely, the Maya had probably used up all the water in the chultun by the time the material founds its way into those two piles. The sherds were removed by zones that permit us to map out where in the chultun each sherd comes from (photo 4). This helps us to see where the reconstructed vessels came from, while the fragment locations can give us hints as to how they were smashed. The BRAP lab is directed by Betsy Kohut (photo 5) who oversees everything coming in and out of the lab and identifies and classifies every piece of pottery we recover. She had already identified each sherd from the chultun by its type (most are a very common Late/Terminal Classic Cehpech pottery type called Muna Slate) and form (basin, dish, vase, etc.) and entered the data into our computer database, completing the initial analysis. 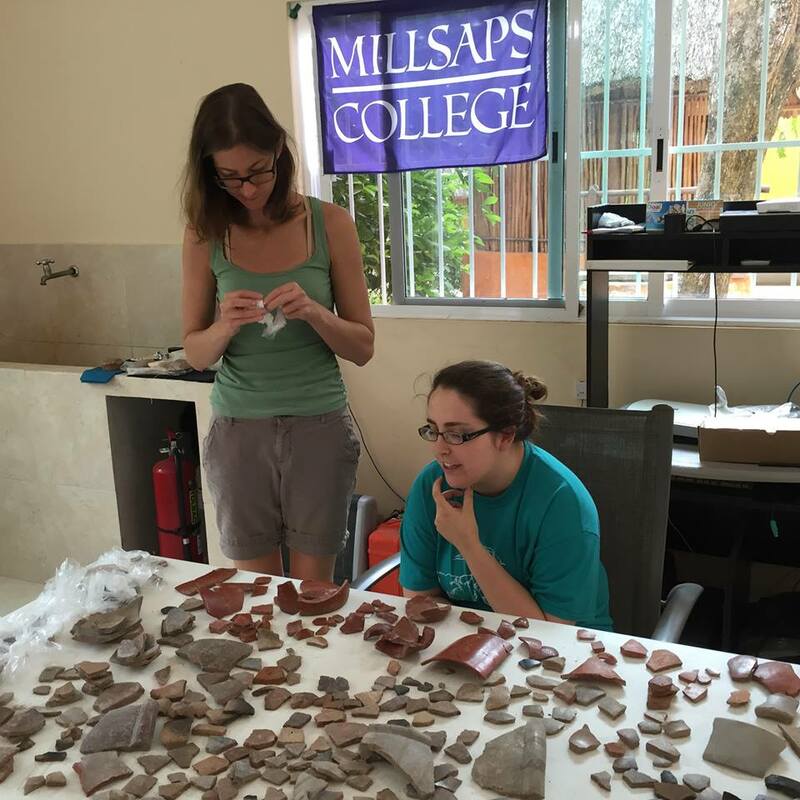 This summer Millsaps College student Lauren Voelker and I are putting every one of these thousands of sherds out on several tables and undertaking the tedious (but exciting) process of trying to “refit” the vessel fragments (photo 6). Essentially we spend 8-10 hours a day in the lab moving pieces into piles based on surface finish, shape, vessel part, and paste color, then trying to see which pieces fit together. When we find pieces that fit, Lauren glues them together using a soluble polymer resin known as Mowital B45H, manufactured by Kuraray. A product normally used in major construction projects, Kuraray was kind of enough to provide us with a kilo of the resin to use in joining the pots. This hi-tech resin is not water based, and thus dries rapidly and creates a very strong hold even in the most humid conditions. After six weeks of work on this giant puzzle, we made significant progress in determining the nature of the ceramic collection inside the chultun. There were at least six complete water jars, known as “chultuneras, specially designed to be lowered through the narrow opening of the chultun (photo 7). 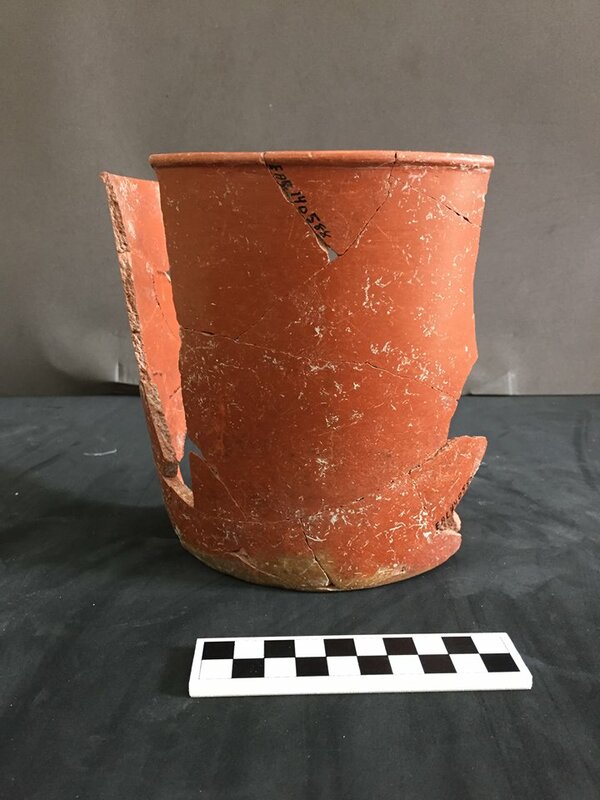 Additionally, we identified several thin red slipped vessels, including a large delicate red vase (photo 8), a number of very large basins, and a small incense burner covered in soot from the last time it was used (photo 9). Despite our progress, there are still hundreds of sherds that we have not been able to group or identify. 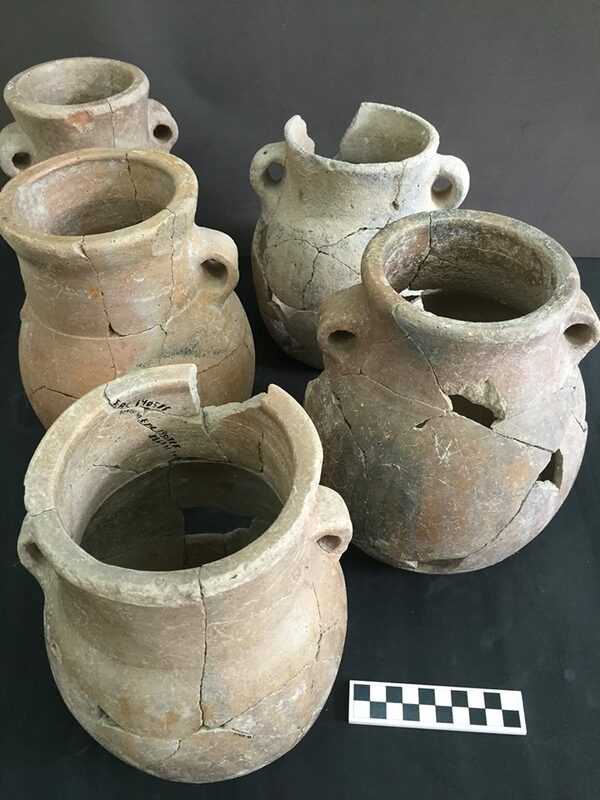 The fact that so many of the vessels are complete and that all of them are from the Late/Terminal Classic period reinforces our idea that the pottery resulted from a very short period of deposition, and may have all been deposited at the same time. It is interesting to learn that the majority of vessels were water collection jars, as these are likely the vessels that were normally used every day to extract water from the cistern when it was in operation. 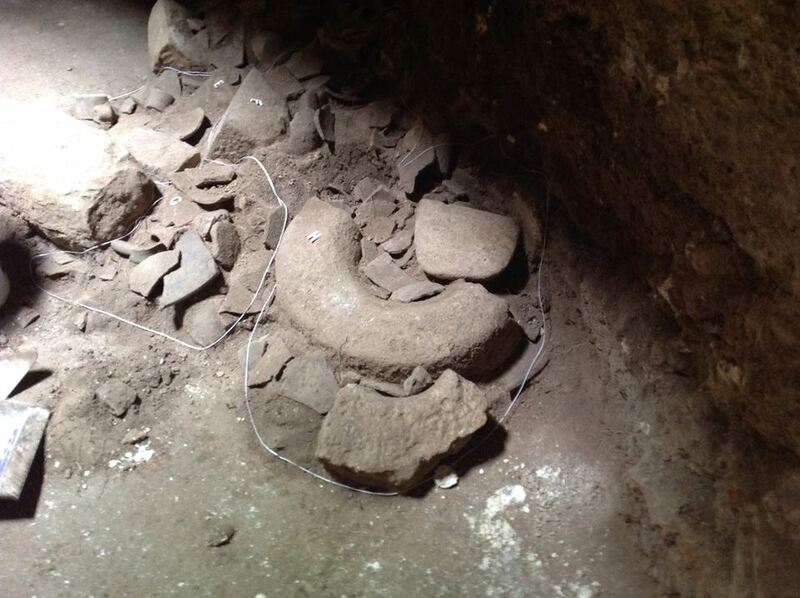 Perhaps they were already in the cistern and left there in storage when the site was abandoned. But what about the other vessels? The basins, incense burner and red ware vessels? Were they stored there as well? Or were they simply broken pieces of trash that found their way into the cistern around the time it went dry? If so, why are there such a restricted number of forms and types? Certain vessels, particularly bowls, plates and large storage jars, which are so common in the trash pits associated with the houses of Stairway to Heaven, are virtually absent in the ceramic inventory recovered from the chultun. 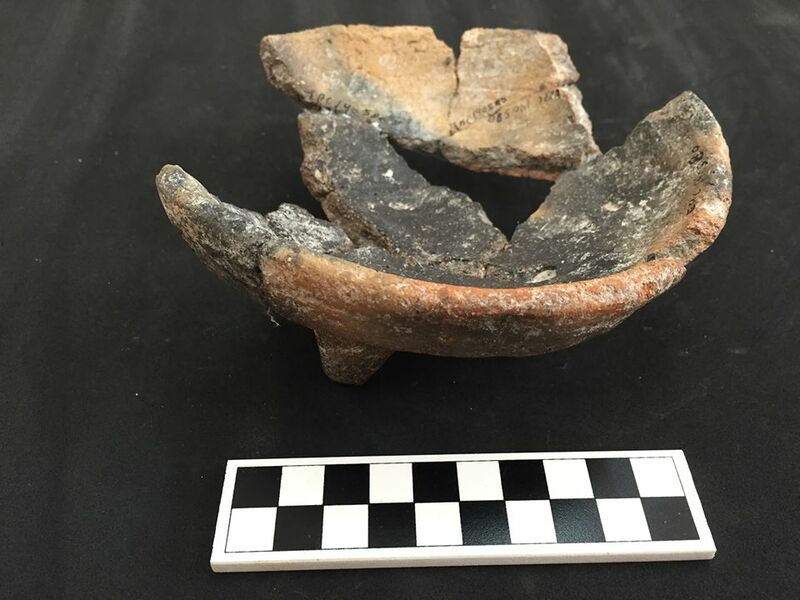 Perhaps other artifacts and features discovered inside the dry chultun can provide clues about the meaning of these vessels and what was going on at the site at or around the time of its abandonment. In the next post, we will look at the additional data and what it adds to our understanding of the chultun and these vessels.